The design is good along with the fit. I've struggled in the past with flip helmets where my chin hits the helmet, this is not the case with this one. It's surprisingly quiet too which is a bonus. Nice one Caberg! Everything I require from a flip up helmet. I measured as advised and purchased a Small it fits perfect.Also I've noticed it feels lighter than my previous Duke. A little bit noisy but to be expected with a flip up but not too intrusive and I ride anyway with earplugs for day rides. Comes with a free pinlock visor insert drop down sun shield 5star rated and therefore would recommend as excellent quality and value for money. Great fit. Excellent quality. Good customer service. Fits well, good quality product that I am very pleased with. Close fitting near the chin area which may be an issue for some wearers. I find for a modular lid, you can't beat a Caberg. This one is 5 star SHARP rated - so already a good start. Add to that it's really comfortable, a sturdy design and good stiff lifting and locking mechanisms - you definitely won't be worried about it being too flimsy. The internal sun visor is an absolute God send - and almost worth it just for that. Add to all that a very reasonable price tag, really, what more could you ask for?! I can highly recommend this lid - and for that matter, SBS. Superb service as always. Very good helmet at an excellent price. Has a 5 star safety rating on SHARP. 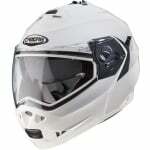 I bought white after attending a "Biker Down" course and being told by the Fire Service that white is the safest colour for visibilty. Practical for all weathers with a pinlock insert for cold & wet weather, it can be used open with the dark internal visor down when it gets really hot. Very convenient at fuel stops and peages etc as the flip up front means you don't need to take off the helmet. I have fitted an Interphone Sport comms unit to it, a tight fit but it works well. Really happy got all the features. Had the previous incarnation so no surprises with this lid. Everything a little better. Well made, feels a quality helmet in all respects. Superb service as always and price match applied straight away. Didn't give it 5 as it's not in the same league as a £600+ Arai or similar but for the price it is as good as it gets. A little noisier than a full face but not as bad I thought it might be. 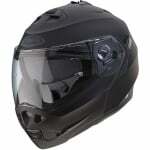 Very comfortable and I usually struggle to find a comfortable helmet.